In addition to keeping the water and coolant level where it needs to be, you can prevent trouble by keeping an eye out for leaks and replacing old or dam­aged hoses. Figure bellow shows the common trouble spots in the cooling system the places where you should check for coolant leaks. Look under your vehicle in the morning to see whether any liquid is on the ground under it. If you see liquid, stick your finger in it and smell it. If it’s coolant (green, red, blue, orange, or rust colored), look around the parts of the car that are over the puddle and feel around for wetness. Look around your radiator for whitish deposits or rust-colored stains. These indicate old leaks that have dried. They may not be all that old; water tends to evaporate quickly on a hot radiator. Also check the front end of the radiator to see whether the surface is befouled with dirt, leaves, and bugs. If so, remove them with a brush and a garden hose. If your radiator catches a lot of debris, you can attach a piece of nylon window screen over the front surface with twist-ties to trap the stuff and keep it from getting stuck between the radiator fins. If you don’t have a safety pressure cap, or if your vehicle overheats easily, the cheapest possible remedy is to buy a new safety cap or replace the rubber gasket in the cap you have. If you aren’t sure, ask a mechanic to pressure-test your cap to see whether it’s functioning properly. If you need a new one, give the salesperson the make, model, and year of your vehicle and check the pressure limits (psi) on the new cap against your owner’s manual to make sure that you’re buying the proper cap for the amount of pressure in your cooling system. Never let a service station you don’t normally frequent hook you into buying a new radiator cap unless you make them pressure-test your old cap. You may want to have them test the new cap, as well. I’ve been sold a faulty new cap to replace a faulty old one! 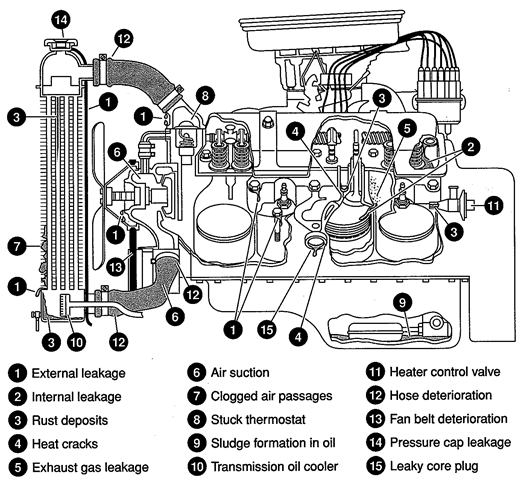 Regularly check all the hoses under the hood of your vehicle, whether or not you’ve been having trouble. For instant panic, there’s nothing like having a hose burst while you’re driving. If it’s a radiator hose, the resulting shower of steam is frightening at best and dangerous at worst. If a vacuum hose goes, the sudden loss of vacuum can stop your car in the midst of traffic. Checking your hoses and replacing the funky ones before they leak can save your nerves and your pocketbook in the long run. If you find a hose that’s soft and squishy, bulgy, hard or brittle, cracked, leak­ing, or marked with a whitish deposit where stuff has leaked and dried, replace it immediately, before it breaks. If you find a hose that is collapsed when the engine is cold but springs back when you remove the radiator pressure cap, the cap or coolant recovery system – not the hose is at fault.